The Stork & Fashion Exchange has a “Drop & Run” system for Children’s Clothing. Because of the large volume that we process, we are unable to check clothing as you bring it in. 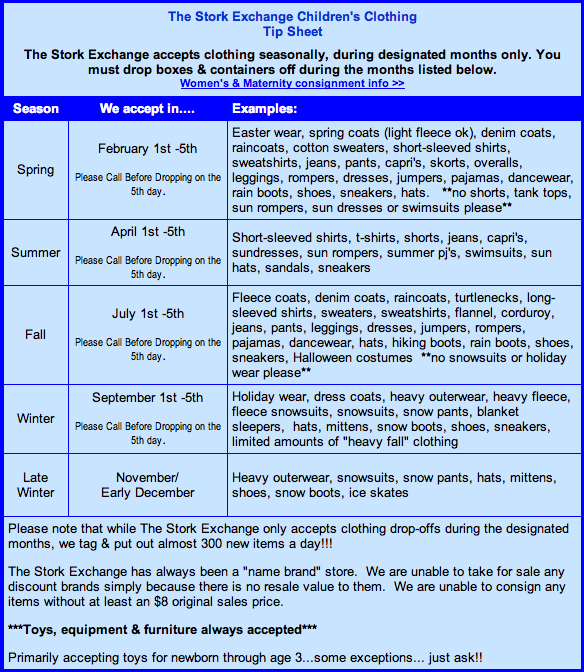 We have provided a very concise “clothing tip sheet” which details season changes and drop-off dates. Once you have separated your seasons and freshly laundered the current season’s clothing, please fold and place items in a Container with a lid or Box with a lid. We ask that you do not use the “super-sized” storage bins or boxes as we must carry these up and down the stairs. Then just drop your bin at the store during regular business hours when we are doing intake and you are done! No hassles, appointments or waiting around! We will have an estimated process time posted on the “consignor update board” which will give you some idea of when your container will be done. We cannot process a box if it has not been freshly laundered. We recommend checking clothing at your home, under bright lighting. Eliminate items that are outdated, stained, have holes, buttons missing or are excessively worn. Launder only the items that meet our specifications. We would like to remind you also that our staff is trained to assess the resale value of items and will often see things that you would not see at your house. The lighting in the store is very different than in your home and we are sincerely not trying to embarrass or offend anyone when we say “no thank you” to certain items. We are simply trying to provide the best quality resale for our customers. The Stork Exchange actually sells 85% of items taken for sale, well above industry averages. The majority of our consignors also shop at The Stork Exchange so we know that you do appreciate our selectivity. Are you a Donate or a Return? When you drop off your containers, we will ask if you are a donate or a return. When we process your containers, if you are a return, we will put the items we are not accepting for sale back in your container and you can pick them up. If you are a donate, we will simply donate those items that we do not consider to be sellable. Please be sure that you want to be a donate as we will not be making follow up calls for containers containing large amounts of unsellable items. Once we have taken items for sale, they will be on the sales floor for 60 days. If you do not claim your unsold items before their consignment period is up, all unsold items become the property of The Stork Exchange.